The three-man Expedition 14 crew of the International Space Station complete a short trip, flying their Soyuz capsule to another docking port in preparation for receiving a resupply ship. Space shuttle Discovery's STS-39 flight, launched in April 1991, served as a research mission for the U.S. Department of Defense. An instrument-laden spacecraft for the Strategic Defense Initiative Organization was released to watch Discovery perform countless rocket firings and maneuvers, as well as canisters releasing clouds of gas. The crew tells the story of the mission in this post-flight film presentation. Seeking to study explosive forces across the universe, the Gamma Ray Observatory was launched aboard shuttle Atlantis in April 1991. But when the craft's communications antenna failed to unfold, spacewalking astronauts ventured outside the shuttle to save the day. The rescue EVA was followed by a planned spacewalk to test new equipment and techniques. The crew of STS-37 narrate this post-flight mission film. Dazzling images from Mars are revealed by scientists. The robotic rover Opportunity has reached the massive Victoria crater with its steep cliffs and layers of rock exposing the planet's geologic history. Meanwhile, the new Mars Reconnaissance Orbiter has photographed the rover and its surroundings from high above. Loaded with a package of telescopes in its payload bay, shuttle Columbia soared into space for the first ASTRO mission in December 1990. The crew narrates this highlights film from the STS-35 mission in which the astronauts worked around the clock in two shifts to operate the observatory. The flight launched and then landed at night, and included the astronauts teaching from space. n this news conference from NASA Headquarters, scientists announce the Hubble Space Telescope's discovery of 16 extrasolar planet candidates orbiting a variety of distant stars in the central region of our Milky Way galaxy. Five of the newly found planets represent a new extreme type of planet not found in any nearby searches. The 200 known planets that orbit other stars exhibit incredible variety. Among them are a handful of worlds that weigh between 5 and 15 times Earth. Astronomers believe these "super-Earths" are rocky iceballs rather than gas giants like Jupiter. While theorists can explain how such worlds form around Sun-like stars, the discovery of super-Earths around tiny red dwarf stars was surprising. New research suggests that some super-Earths build up rapidly when local temperatures drop and ices condense out of the surrounding gas. "We believe that some super-Earths form during a cosmic 'snowstorm.' Only this snowstorm envelops the whole planet and lasts millions of years,'" said astronomer Scott Kenyon of the Smithsonian Astrophysical Observatory. All planets form within a disk of gas and dust surrounding a newborn star. Rocky planets form close to the star, where it is warm, while icy and gaseous planets form farther out, where it is cold. When it was young, the Sun was relatively stable, leading to a natural progression of small, rocky worlds in the hot inner solar system and large, gaseous worlds in the cold outer solar system. In contrast, planetary systems around small red dwarf stars undergo dramatic changes in their early history. As the young star evolves, it dims. The warm inner disk starts to freeze, creating conditions where water and other volatile gases condense into snowflakes and ice pellets. "It's like a massive cold front that sweeps inward toward the star," explained first author Grant Kennedy of Mount Stromlo Observatory in Australia. "The ices add mass to a growing planet, and also make it easier for particles to stick together. The two effects combine to produce a planet several times the size of Earth." The disks that surround small red dwarf stars tend to contain less material than the disk that formed the solar system. Without the "snowstorms" in these smaller disks, there is not enough material to make super-Earths. Although astronomers have discovered a few super-Earths orbiting red dwarf stars, it may be tough to find worlds hospitable to humans. All of the known super-Earths are icy worlds with no liquid water. 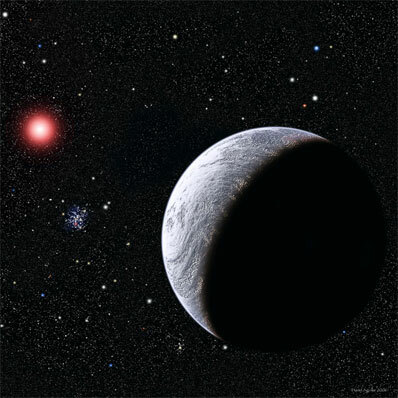 Red dwarf stars are so dim and cool that their warm "habitable zones" are very close to the star, where there is very little planet-forming material. "It's difficult to make anything larger than Mercury or Mars in the habitable zone of a red dwarf," said Kenyon. The astronomers presented their calculations in a paper authored by Kennedy, Kenyon, and Benjamin Bromley (University of Utah). The team now plans to conduct detailed numerical simulations to derive typical timescales for the formation of super-Earths around red dwarf stars.